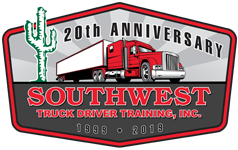 Southwest Truck Driver Training Tucson Campus is the only truck driver school that is not owned by a trucking company. Why does that matter? We are student focused and not worried about filling up OUR trucks. Our goal is to train exceptional drivers and assist them in finding the job placement THEY want. We want to train students in Tucson with careers in trucking. Why Choose Southwest Truck Driver Training? I acknowledge that, by clicking the Request More Info button below, as my official signature, I consent to representatives of Southwest Truck Driver Training and/or a party representing Southwest Truck Driver Training to contact me about educational opportunities via email, text, or phone, including my mobile phone if provided above, using an automatic dialer, or pre-recorded message. Message and data rates may apply. I understand that my consent is not a requirement for enrollment, and that I may withdraw my consent at any time. © 2018 Southwest Truck Driving School. All Rights Reserved.